This card gains 500 ATK for each Dragon-Type monster your opponent controls or is in their Graveyard. .. Skill activation:- Flip this card over when you activate this Skill. Effect :- Once per turn, if you control a Zombie monster, you can place 1 counter on this card. All Zombie monsters you control gai.. 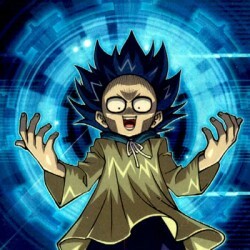 Skill activation :- At the start of the Duel, place this card in your center Spell & Trap Zone. You cannot activate this Skill during your first turn of the Duel. You draw 1 less card at the beginning..
You can Tribute this face-up card; take control of all face-up Level 3 or lower monsters your opponent currently controls. .. Skill activation :- Flip this card over when you activate this Skill. Effect :- Once per turn, if you control "Queen's Knight", you can pay 1000 LP to Normal Summon 1 "King's Knight" in addition to yo.. When this card is Normal Summoned while you control "Queen's Knight": You can Special Summon 1 "Jack's Knight" from your Deck. .. Skill activation :- At the start of the Duel, place this card in your Field Zone and flip it over. Effect :- This card's name is always treated as "Necrovalley". All "Gravekeeper's" monsters on the fi..
"Queen's Knight" + "Jack's Knight" + "King's Knight". A Fusion Summon of this card can only be done with the above Fusion Materials. Once per turn, during either player's turn, when a Spell/Trap Card,..
(This card is not treated as a "Fusion" card.) Pay 1000 LP, then target 1 Level 7 or higher Spellcaster-Type monster you control; this turn, only that monster can attack, and it must attack all monste.. If you control 2 or more Attack Position Spellcaster-Type monsters: Target 1 of them; its ATK becomes 3000 until the end of this turn, also for the rest of this turn after this card resolves, other Sp..
"Battle Ox" + "Mystic Horseman"..
"Blue-Eyes White Dragon" + "Blue-Eyes White Dragon" + "Blue-Eyes White Dragon" ..
"Red-Eyes B. Dragon" + "Meteor Dragon" ..
Switch the original ATK and DEF of all face-up monsters currently on the field, until the End Phase. .. This card can only be equipped to a Warrior-Type monster. A monster equipped with this card increases its ATK by 700 points. A Dragon-Type monster that battles with the monster equipped with this card.. Draw 2 cards, then remove from play 1 Normal Monster Card from your hand. If you don't have any Normal Monster Cards in your hand to remove, send all cards in your hand to the Graveyard. .. When this card is Normal or Flip Summoned: You can add 1 Ritual Monster from your Deck to your hand. .. When an opponent's monster declares an attack: You can send this card from your hand to the GY; change the attacking monster to Defense Position. When you Ritual Summon a monster, you can banish this .. This card cannot be Normal Summoned or Set. This card cannot be Special Summoned except by removing from play 1 EARTH and 2 WIND monsters from your Graveyard. Once per turn, you can discard 1 card to .. This card gains 300 ATK and DEF for each "Harpie Lady" on the field. ..
You can reveal 1 other "Amazoness" monster in your hand; Special Summon this card from your hand. You can only use this effect of "Amazoness Spy" once per turn. When this card is destroyed by battle a.. When this card is flipped face-up: You can target 1 card in your opponent's Graveyard; place that target on the bottom of their Deck. If this card is sent from the field to the Graveyard after being f..
During your Draw Phase, if you draw a DARK monster(s): You can reveal any number of them; send them to the GY, then you can draw 1 more card. ..